Every fleet owner has limitations. Nobody can do it all, all the time, and continue to grow the company. At some point you have to sell out to grow up! Selling out can take many forms. Some owners are happy to just sell their fleet, collect the cash and move on. However, most owners do not want to sell out totally. They know their fleet can be more successful, but they also realize they do not personally have the cash, market reach, equipment, sales team, and bonding (insert your limitation here) to take it to the next level– even though they have the skills and experience. This is when you need to sell out to grow up. A very successful client we worked with was in this exact situation. His company provided environmental remediation services. He had built a great company and had a strong track record of completing projects on time. His customers were happy and provided strong referrals. He had the management skills and team in place to grow exponentially. However, he lacked the financial ability needed to win the larger contracts that would take his company to the next level. He realized that he needed to sell out to grow up. He sold a major portion of his company to a buyer, who provided similar, but not competing services in other parts of the U.S. Selling enabled him to personally take some cash off the table from the sale, secure the financial backing needed to win bigger contracts, expand his marketplace and take the entire company to the next level of success. When your company needs more cash to purchase new trucks or equipment to win larger contracts or serve a growing market. When you need a larger sales team to expand your services into another region or even nationwide. A new owner or partner who already operates in other markets or nationwide may be able to add your fleet’s services to their current sales portfolio. When you already have the delivery capability to serve more customers, but lack the sales and marketing ability to expand into new markets. A new owner or partner may be the perfect way to reach those new markets. When your company lacks the support team needed to reach the next level. A new owner or partner may provide legal, finance, accounting, marketing, HR, training and other support functions that you simply could not. When you need to diversify the services you provide to reach the next level. Perhaps you need more warehouse space or additional locations. A new partner or owner may offer the perfect lineup that meets additional needs of your existing clients. 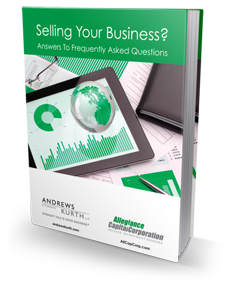 This enables you to rapidly expand sales without adding any additional trucks. You combine two successful companies into one powerhouse. When you realize you are ready for the next opportunity in your life. Many entrepreneurs are great at the startup and development phases of companies. However, they simply do not enjoy the day-to-day management of an established company. If this describes you, selling out is definitely the best way to grow up. It enables you to monetize your success and have solid, personal funding for your future – whatever that may include. As our client realized, selling out was not a bad thing. It was simply another financial management tool that enabled him to grow the company, expand into new markets and ultimately take the company to a whole new level of success. The next time you are thinking, “I know exactly what I need to get to the next level, but I can’t do it alone,” you might want to consider selling part of your company. Many times it is the easiest, most direct route to the next level. Plus, you get rewarded for the hard work you have invested in your company and after the sale there is a high probability that you will still be on the job, helping the new company reach that next level. It can be a win-win for everyone. Selling out can be a great way to move up.